Cisco released an update to their Visual Networking Index, highlighting the increase in IoT applications and in data consumed by mobile devices worldwide. The global digital transformation is getting faster and increasing considerably these last five years. The direct impact is the high demand and requirements of IP network infrastructures. The number of internet users is growing and it is predicted that 58% of the worldwide population should have access to the internet by 2021. To mention, the rise in the machine-to-machine (IoT) connections that represented almost 50% of the total IP traffic in 2016. IoT innovation is growing fast in many different sectors such as connected home, healthcare, and smart transportation services. 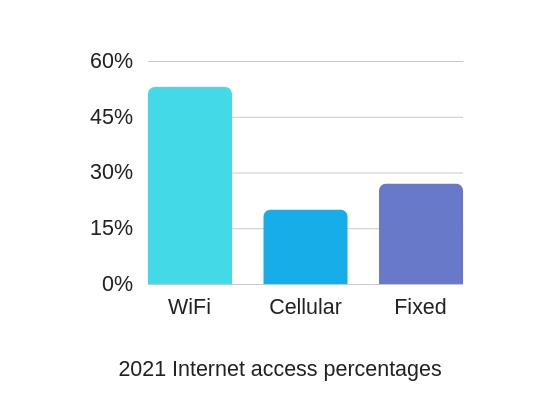 In 2021, the WiFi and mobile-connected devices are expected to generate 73% of total IP traffic, an increase of +10 points from 2016. 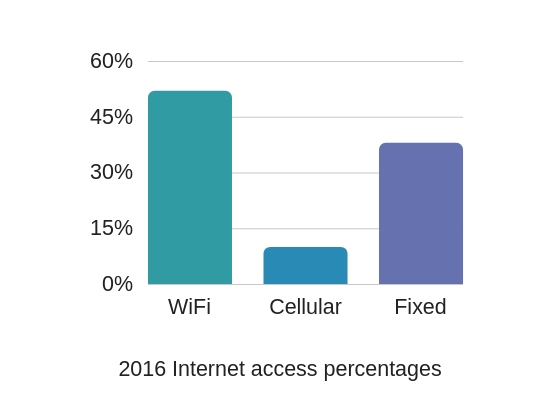 Moreover, the total number of public WiFi hotspots and homespots will grow from 94 million in 2016, to 541.6 million by 2021. Public hotspots will mainly be concentrated in China, Us, Japan, and France. WiFi infrastructures will be deployed in many different sectors such as hospitality, education, public transportation and healthcare. In addition to this increase in WiFi hotspots, the average broadband speed is rising too, from 27.5 Mbps to 53.0 Mbps projected in 2021, allowing internet users to access many online services such as video viewing that should represent 82% of the total IP traffic in 2021. The challenge for Internet Service Providers implementing public hotspots will be to deploy better WiFi network infrastructures while dealing with the increasing number of personal devices and number of concurrent users together with the high demand for bandwidth. Tanaza developed the Access Point Selector to help network administrators when deploying WiFi infrastructures. This free tool allows professionals to select the right model of hardware based on a WiFi project (taking into consideration the type of location, the coverage area and the usage of the network). Many of WiFi professionals relied on the Access Point Selector for their WiFi deployment and took advantage of the Tanaza multi-vendor aspect to increase their business opportunities. We selected only a few of the statistics that grabbed our attention, but if you want more information about the global IP traffic in 2016-2021, you can read the original article by clicking here.